The RRC200 Pneumatic Quarter Turn Actuators have been developed by Rotork Australia for demanding applications and where aluminum cannot be accepted. The compact fluid power actuators feature pre-tensioned springs for safety and are double acting or spring return. The actuators are based on the Scotch Yoke principle which delivers high torque in the end positions. 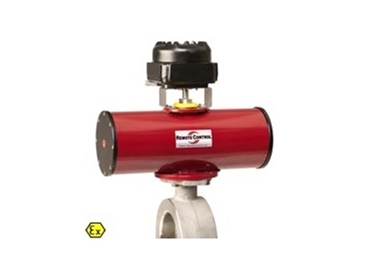 With a large temperature range of -20°C to +80°C, epoxy coated steel housing, PTFE treated cylinder and stainless steel drive shafts and screws, the actuator is highly reliable and has a long life. Additional options include manual override, customised paint job, quick acting, speed restrictor, oil hydraulics, low temperature and high temperature.